Where there is darkness, let the stars shine in. Where there is a void, let replenishment reign. Where there is joy, let it multiply. Welcome light. Receive light. Give light. Live light. 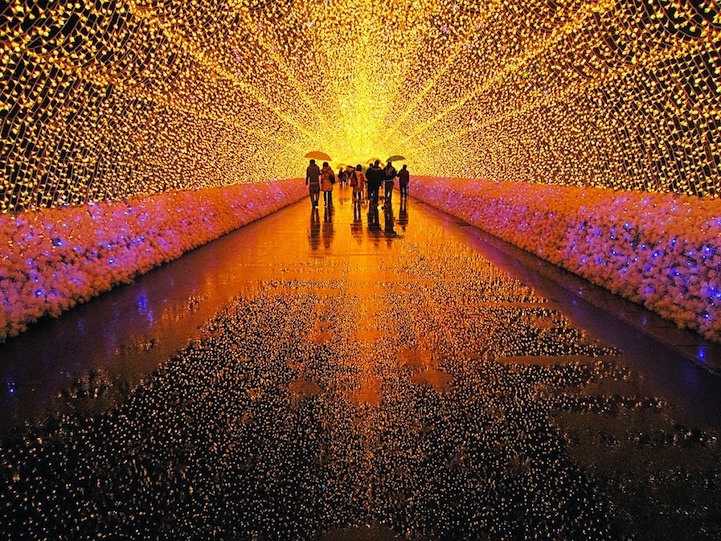 Japan’s Tunnel of Lights, part of Winter Illuminations at Nabana no Sato, which runs until March, 2013. These are my words to you, this Diwali, and this coming year. Thank you, my dears, for your support these past few years and for your comments, readership and shared smiles – they transcend technology and I can feel them on this side of the screen. Here’s to a year filled with colour, with sparkle and a spring in your stiletto step. That glorious photo is by Hiroaki Kaneko, taken of the Tunnel of Lights installation. It inspired me, this Diwali.